Sumeria is a collection of psytrance from all tribes living on the magic island Ibiza. 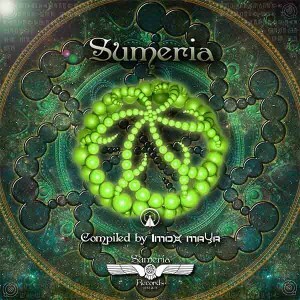 Compiled by Imox Maya for Sumeria Records, this energetic compilation emerged from the positive atmosphere at Ibiza psytrance parties and was created by a diverse psychedelic menu of artists from all over the world. The journey begins with a spiritual progressive beat that will drive you into deep morning psytrance. This trip keeps on going with very twisted psytrance soundscapes that will blast any dance floor. Mastered by Lior Lahav @ Sonesta Mastering Studios, Israel. Graphic design by Sumeria Records, Ibiza. MP3 Download | FLAC Download | WAV Download · Download count: 13,465. This is one solid album. Imox Maya and Galactivation are truly killing those tracks. Akashic Realms is truly one of the most mind bending ones I have heard. Good work!! I’ve been hanging for some more Galactivation for a while, thanks! Tried downloading flac and wav and it keeps failing, not sure why?? Wow, Hedera Helix!!!! “Time For Another Planet” is gorgeous! That new Galactivation track is pretty solid, another epic full-on journey from him. This VA is packed with some seriously high quality produced tunes. I have watched a few of these tracks turn the dance floor into a frenzy. Elements of both light and dark will keep you entertained and give these tracks a deeper drive/feel. Overall, not the best stuff I have ever heard by all means, but I give respect and credit where it is deserved. These are very well produced tunes, and to be released for free speaks worlds about the artist’s involved. Imox Maya has a keen ear for quality psy, my upmost respect given for compiling this VA. Mind cocktail is the archetypal tribal, rolling, well produced full on track. Got the right amount of variation and repetition. Cannot wait to unleash it on some unsuspecting fools.